Golfing Holiday packages designed by GOLFERS for GOLFERS! With over 15 years in the business and thousands of happy clients GETAWAY GOLF AUSTRALIA is your GOLF TRAVEL SPECIALIST. As a professional travel agent, we are your one stop solution for flights, accommodation, car hire, travel insurance and more. We also specialise in group travel including conferences and special events. Over the past 15 years Getaway Golf and Leisure Travel has built a vast network of travel and leisure suppliers, allowing us to offer our clients the best value for money. These relationships also let us offer exclusive access to some of the world’s most sort after golf courses and experiences. Get in contact with one of our friendly staff today and experience the Getaway Golf and Leisure Travel difference for yourself. Buy discounted golf for the best golf courses in Australia. Book your golf and accommodation with us and save! 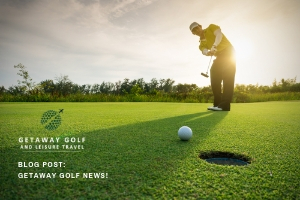 Play top golf courses around the world at discounted rates. We can organise all aspects of your group event. 2018, "What is in it for you"